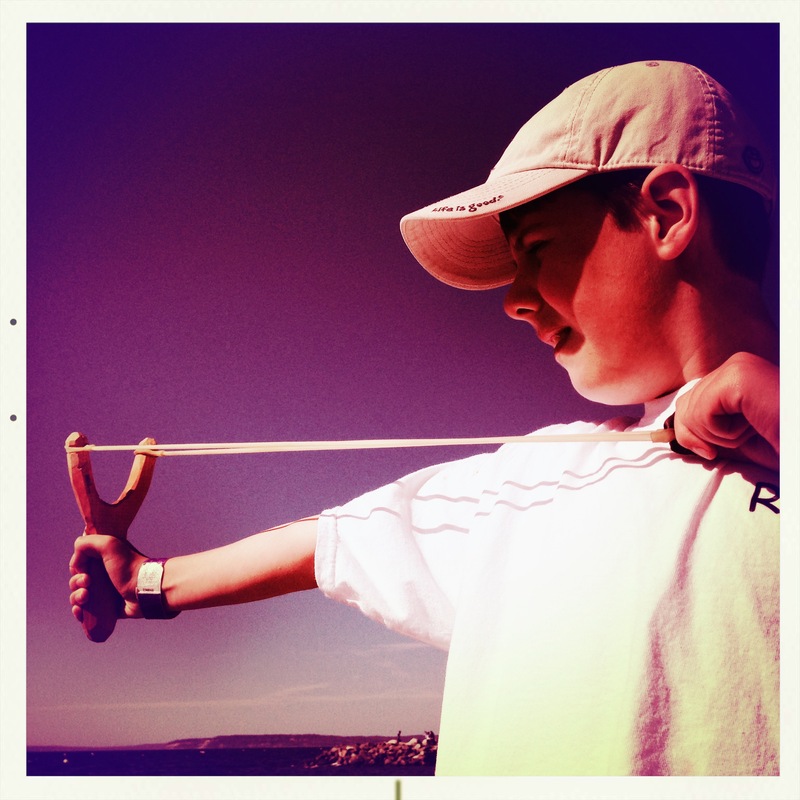 This simple slingshot has been our “go to” toy of the summer. It travels everywhere with Ryan, tucked into his back pocket, along with a few small pebbles ready to fire whenever we are in a location that is wide open and away from windows. I love that his first choice for play is an old-fashioned, outdoors kind of toy instead of spending his summer inside with video games and hope as the teen years approach he continues to find happiness outside exploring, hiking and playing with rocks at the beach. Sophia followed suit too — she tucks her into her puppy-purse and carries it everywhere now too! Ditch the video game counsel so he continues to enjoy the outdoors. When my kids were growing up I took a firm stand and did not allow video games in our home. Sounds Draconian but I now have two young adults who spend their time on other interests. I think that is a great plan. We have a Wii console but Ryan hasn’t turned it on once this entire summer… kids definitely need a chance to find out other activities are even more fun and interesting than the latest video game. You’re welcome Ed. 🙂 Thanks for visiting and reminiscing with me today! I liked that it was a toy that a “real” boy would enjoy in this age of techno-entertainment. Thank you and how fun to hear your story about the same kind of toy! Thank you! Your Play and skateboard action photos are great too! I had one of those sling shots as a child….luckily for all the birds in our garden I was an awfull shot. Oh yes, actually succeeding would have been sad. It’s a good thing trying is enough fun! Thanks so much! I like it for the same reasons and it’s nice to hear you have the same impressions.